Four months later, I happened to finally get caught up in Nairobi rush-hour rain. This is the type of rain that pounds the city conveniently around 4 p.m. to 6 p.m., at about the same time that you also plan to rush home. The rain while quite sensitive of Nairobi's need of a reliable piped water supply and reliable hydroelectricity, is usually quite insensitive of it's timing. This time round, it did not even matter that East Africa was reportedly in the midst of it's greatest drought in 60 years. My normal evening commute results in me crossing over from the Limuru Road bus stop over at Khoja near the fire station across the lower edge of the Central Business District to the Bus Station just opposite St. Peters Claver. This is quite a challenging route, not only due to the amount of human traffic, but due to the disorder frequently brought in by hawkers occupying pavements and matatus that will drive on the wrong side of the road, or make illegal turns. When it is raining, navigating downtown becomes a tricky affair. If you are lucky enough to have an umbrella, you have to squeeze in the roads with the matatus and other vehicles. The pavements are usually huddled sheltering from the rain - it would be an insult to drip rain water off your umbrella onto them while poking them with the umbrella spokes. In such situations, you would thinks that your pair of expensive Bata shoes would be the least of your worries. However, as I came to find out yesterday, that uncomfortable feeling of wet squishy socks on the heels of your shoes are not a result of matatus splashing water on your shoes. Bata Hush Puppies are intentionally manufactured to allow rain water, and any other form of water including sewage to seep through what they call "comfort gel" right into your shoes. The comfort gel is a badly placed piece of clear plastic that will soon fall of the rest of the rubber sole, providing an unobstructed means for water to seep into your shoes. I was quite sceptical of the the contraption on the Kshs 6,000 shoes that consisted of what looked like a mixture of clear and blue plastic. However, I was fooled by the price tag, that Bata must have put some work into making sure that it was a solid structure. So there you have it, the imported pair of expensive Bata Hush Puppies are not worth the price tag they come in. Previously, I had bought my last pair of shoes from an Ethiopian trader at Amco Plaza in Nairobi's Eastleigh Business District. While the shoe's sole might have been a bit hard for my liking, it costs a third of what Hush Puppies do, and I feel safer walking with them in rainy weather. 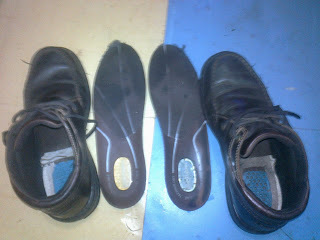 Before that, my last pair of shoes were a second hand well worn pair rubber soled leather shoes that I bought for Ksh. 1,000 form a couple of miraa chewing Meru's in Githurai. This pair lasted for 3 years, and was only replaced because of a tear in one shoe , but still, they were quite comfortable and rarely leaked despite the tear. My next pair of shoes will probably be from Servis, the retailer who has been cunny enough to set shop next to a few Bata outlets in Nairobi. They are probably more affordable and have skills in importing leak proof shoes.